If you saw this woman at the Olympic games, what would you think? You’d probably think she was someone’s grandmother, right? And you wouldn’t be wrong. This 74-year-old woman is, in fact, a grandmother. Even a great-grandmother. And that’s what officials saw as they turned her away from restricted areas, likely assuming she was confused, an elderly lady misdirected on the way to her seat. Yes, she’s a great-grandmother. But that’s not all she is. Anna Sofia Botha (also known as Tannie Ans Botha) was in the stands last Sunday, watching South African runner Wayde van Niekerk win a gold medal and smash a world record no one had been able to touch for 17 years. She was beaming with pride. So much of an athlete’s ability can be attributed to the combination of intense hard work and genetics, but undoubtedly a portion of their success is due to the work of their coach, the person who recognized their potential and encourages their abilities, enabling an athlete to make the journey from good to great. 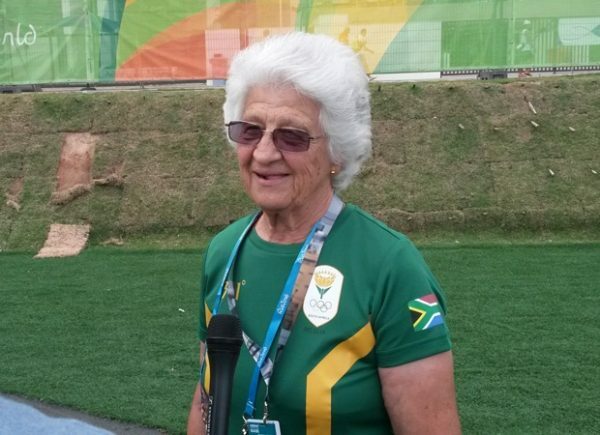 But until van Niekerk’s incredible finish and subsequent publicity, when people looked at Anna Sofia Botha, they saw a great-grandmother, an older lady at the Olympics as a spectator, instead of the coach of a future gold medalist. Just like when a commentator looked at a female gymnast and saw a girl writing in her diary instead of a world class athlete making notes on her performance. Or when another commentator looked at a successful swimmer and saw someone who should’ve made a different choice about her career instead of an intelligent woman choosing the future she wanted. But we’re humans—we make assumptions about a person the moment we meet them. Our subconscious biases kick in and we reach conclusions, sometimes before the other person has even said a word. It saves us time; it keeps us from having to invest mental energy in a stranger. But sometimes those psychological shortcuts lead us to underestimate talented human beings, revealing unfair judgements we refuse to release, even when we encounter opposing evidence (like Botha’s official credentials that should’ve allowed her access to restricted areas). No matter how we try to reduce them to a simple identity, people are more—more than what we see, more than our biased assumptions. And until we acknowledge that reality and are willing to question our assumptions, coaches of Olympic champions will keep being turned away at the door. In case you haven’t been keeping up with the Olympics, allow me to introduce you to Maya DiRado. She’s a swimmer, a Stanford grad (with a degree in management science and engineering), and highly intelligent (earned a perfect score on the math section of the SAT at the age of 15). This is her first Olympics. It’s also her last. She’s retiring from swimming, moving to Atlanta with her husband, buying a house, and starting a job as a business analyst. When I heard the commentators talking about her during her first swim at the Olympics, it caught my attention. She just sounded cool, like someone I’d want to hang out with. I know what he meant—that if Maya were to continue swimming, she would no doubt achieve major feats. And she’s a joy to watch, since her gracious spirit and warm enthusiasm bubble over into every interview. But Mr. Commentator, it’s not a shame. It’s not a shame when a woman chooses her own life path. It’s not a shame when she decides to go for what she wants, even if it’s not what you, sitting up in your booth, want. It’s not her job to consider what the world thinks she should do. As it is 2016, this smart young woman gets to decide her own career path. When you declare that it’s a shame she’s giving up competitive swimming, you’re making the statement that her worth is in swimming, that it’s the most she can offer the world. How on earth can you determine that? You cannot know her potential. You have no idea what she could achieve outside the pool. From what I can see, Maya DiRado is intelligent, hard-working, and poised. Something tells me she is well-equipped to make smart choices about her own life. And that, Mr. Commentator, is no shame. In fact, it’s a beautiful, incredible thing. And I, for one, am thrilled to see it.